Madison Dental is a family-friendly dental practice. We love children and want to make sure your whole family has bright and healthy smiles. Our dentists provide dental care for kids of all ages, from babies and toddlers to teenagers preparing their smiles for graduation. What are children's dental services? We focus on providing dental treatment and education to kids ranging from infants to teens. Our dentists help to prevent oral decay in children by educating families on safe dental practices. We also treat dental complications that your child may face as they grow. It is essential that children establish good dental habits as early as possible. This will help to prevent oral complications later in life. For this reason, we recommend that your child see a dentist within six months of their first tooth or before their first birthday. We provide specific services to promote the dental health of your whole family including children. Some of these services include dental exams, hygiene education, x-rays, fillings, and root treatment. Our dentists note the health and condition of the teeth, gums, soft tissues, head and neck. We monitor the growth of the jaws and the development of the teeth. We use all of these factors to create a customized treatment plan. Our hygienists clean your child's teeth to remove any plaque or buildup. We also treat the teeth with fluoride to strengthen them and make them more resistant to tooth decay. We recommend cleaning and fluoride treatments twice per year. Prevention is a vital part of our children's services so we provide essentials for home dental care such as brushing techniques. Children generally need x-rays more often than adults since their mouths are growing and changing rapidly. We use x-rays to survey erupting teeth, diagnose bone diseases, analyze the extent of an oral injury, and plan orthodontic treatment. Pediatric x-rays allow our dentists to treat conditions that cannot be visually detected during an oral examination. If treated early enough, dental care will be less invasive. We recommend that children receive x-rays every six months to detect any cavities that may be developing between the teeth. We provide special fillings for children that have chipped or broken teeth. Root therapy focuses on the pulp of the tooth. This pulp contains nerves and blood vessels that supply nutrients to a child's tooth. Root therapy is performed in order to save the tooth when the pulp gets infected or injured. During treatment, the hollow area inside the tooth is cleaned, disinfected and filled. Symptoms that indicate a need for root therapy can include toothache, sensitivity to hot and cold, or large cracks in the teeth. We recommend your child see a children's dentist if they experience one or more of these symptoms. Looking for a new dentist? Look no further! We would be happy to meet with you and your family. 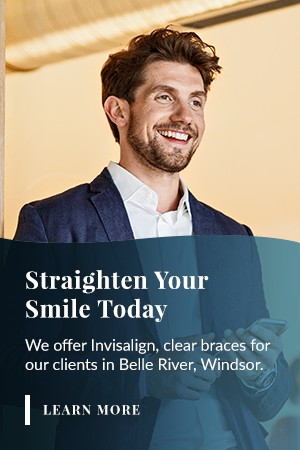 Book an appointment at our location in Windsor today!